Chapelburn in Fearnan, near Aberfeldy, Perthshire sleeps 10 people. 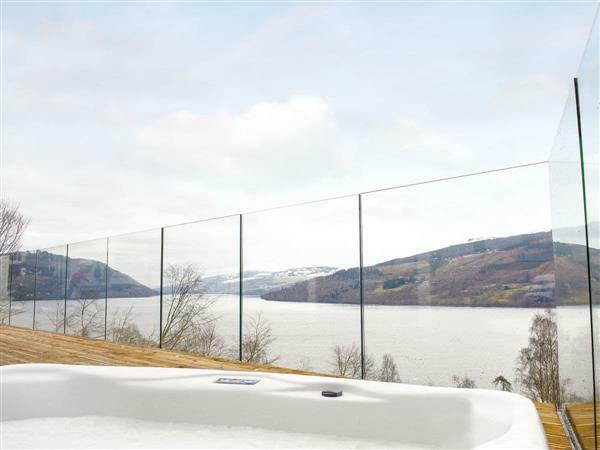 Chapelburn near Aberfeldy has spectacular views over Loch Tay to the surrounding Perthshire countryside; Chapelburn is in a superb location for a family or a group of friends who want to spend time together. Originally a chapel, the building dates back to the 1900s and is located next to the stream and pool where it is believed to have been used for baptisms. Chapelburn is a detached cottage which has undergone a unique and innovative conversion transforming it into a spacious holiday home. It is the perfect property for guests wanting top quality accommodation in a fabulous location. The hot tub on the elevated decking outside adds to the experience. To take full advantage of the south facing location, the decking with clear balustrades is along the full length of the front of the cottage and the ground floor rooms all have doors leading onto the decking. The focal point of the cottage is the large open plan living area, furnished to a high standard and a great place for everyone to be together. There is a large TV, a cinema projector and you can play DVDs or plug in your iPad and watch movies. Families will also enjoy the added bonus of a 7 foot pool table. The well-equipped kitchen area boasts high quality fixtures and fittings and the second living room has a cosy double sided wood burner and comfortable sofas if you want to relax. There are also three well-presented bedrooms with patio doors leading onto the decking area. On the first floor the two super king-size bedrooms benefit from balcony windows providing great views. Guests will find plenty of outdoor space with ample garden furniture and a footpath down to the loch side. There is lots to do in the area and the conservation village of Kenmore at the east end of Loch Tay has a shingle beach and great views down the loch where guests can enjoy water sports, loch cruises or maybe a spot of fishing. There is a local shop, a post office, deli, the oldest inn in Scotland, restaurants and Croft na Caber Centre, a reconstruction of an Iron Age stilt dwelling built over the water. Kenmore hosts a traditional ceremony each January to mark the opening of the salmon season on the loch. This area is well known for outdoor activities with lots of walking and climbing opportunities available. Fearnan is at one end of the Tay Forest Park and leads to the hamlet of Fortingall, home of the Fortingall Yew, the oldest tree in Europe. At the far end of the loch is Killin and the Falls of Dochart, and a superb drive from here to the Bridge of Balgie leads to the top of Glen Lyon, the longest in Scotland. Golf is widely available throughout the region as well as horse riding, fishing, quad biking, bird-watching and cycling. Guests can take a Highland safari exploring the mountains, spot local wildlife including deer, visit whisky distilleries, historic castles and gardens. Whatever you choose to do during your stay you can rest assured that the luxury of Chapelburn awaits your return. The shop is 4 miles from Chapelburn near Aberfeldy, with the pub and restaurant 2 miles from Chapelburn. Living area: With 56 Freeview TV, cinema projector, DVD player, pool table and bi-fold doors leading to decking. Bedroom 1: With king-size bed, 33 Freeview TV, patio doors leading to decking, and en-suite with shower cubicle, toilet, heated towel rail and patio doors leading to decking. Bedroom 2: With king-size bed, 33 Freeview TV, patio doors leading to decking, door leading to sun porch, and en-suite with walk-in shower, toilet and heated towel rail. Bedroom 3: With king-size bed, 33 Freeview TV and patio doors leading to decking. Bedroom 4: With zip and link super king-size bed (can be twin beds on request) and 33 Freeview TV. Bedroom 5: With zip and link super king-size bed (can be twin beds on request) and 33 Freeview TV. Oil central heating (underfloor in boot room), electricity, bed linen, towels and Wi-Fi included. Initial logs for wood burner included, remainder at £5 per basket. Travel cot, highchair and stairgate available on request. Welcome pack. Decking with garden furniture and gas barbeque. ½-acre landscaped grounds. Hot tub for 6 (private). Bike store. Private parking for 5 cars. No smoking. Please note: There are 2 sets of steps and sloping banks in the grounds. A gate in the grounds leads to the loch, 500 yards, and a stream, waterfall and pond, 20 yards. Holidays at Chapelburn run from Friday to Friday. For a better idea of where Chapelburn is, you can see Chapelburn on the map below. Chapelburn is in Perthshire; should you be on the lookout for a special offer, you can find all the special offers in Perthshire. It's always worth checking to see what is on offer at the moment. Do you want to holiday near Chapelburn (UK5654), you can see other cottages within 25 miles of Chapelburn; have a look to find your perfect holiday location.